I want to run optical cable from TV to one soundbar directly above TV and to another soundbar directly across room requiring approx. 35 feet of optical cable but descriptions say the splitter has no loss of sound up to 16 ft of cable. Also I need one male end on one end and 2 females on other end of splitter (male end would insert into TV) Any suggestions ? Run 3 or 4 10ft. cables with male/female connectors in between ? BEST ANSWER: Thank you for your question. We would not have a splitter with a male end. Perhaps using a short optical cable will be best. As for the length, you could run into issues splitting the signal and running the length needed. You can try it out if you would like, we do offer a 30 day return policy and you can return it if it does not work out for you. Does this happen to have optical output capabilities via way of a 3.5mm to toslink adapter? BEST ANSWER: Thank you for your question. Unfortunately this unit would not be capable of using a mini toslink to 3.5mm adapter. So far it’s working as it is supposed to. I am hopeful it will continue to do so. Works great with my iMac toslink out. Not much more to say! First time customer. Works great! Cheaper than Amazon! An improvement over the previous. Even tighter and sturdier than the previous . Fast, nicely-packaged delivery. I recommend it. 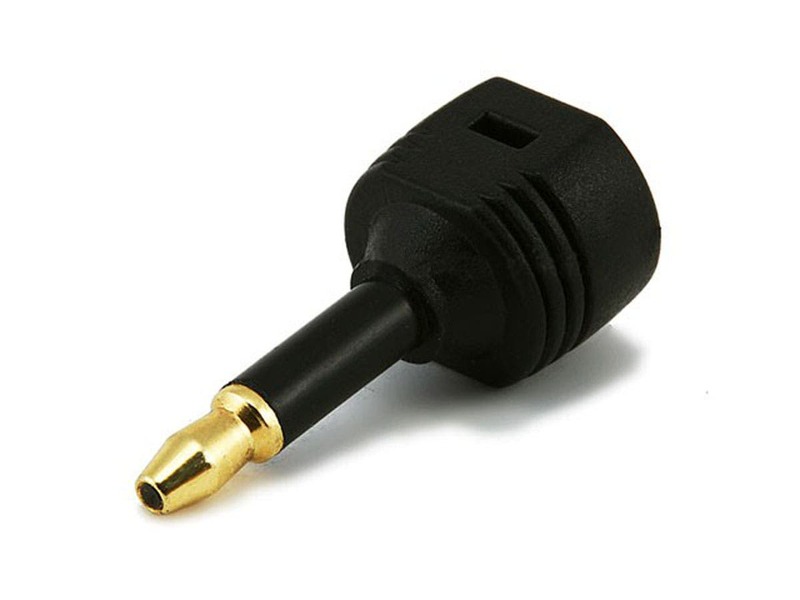 PRO: I put this adaptor on my optical cable and it fit into the audio jack for my 13" macbook pro (late 2011). Now my home theater system receives dolby digital or dts audio depending on what I'm playing. Therefore this is an excellent product because it gets the job done considering the price, no doubt. CON: I recommend ordering at least two or more instead of one just in case you get a defective. One of mine was defective. I'm not surprised since the quality is very cheap. The problem is that the hole at the tip of the adaptor is normally supposed to be covered (it's not supposed to be see-thru hole). A one-inch "plastic stick" is inserted through the hole, normally covering it. Mine was missing this "plastic stick" piece. 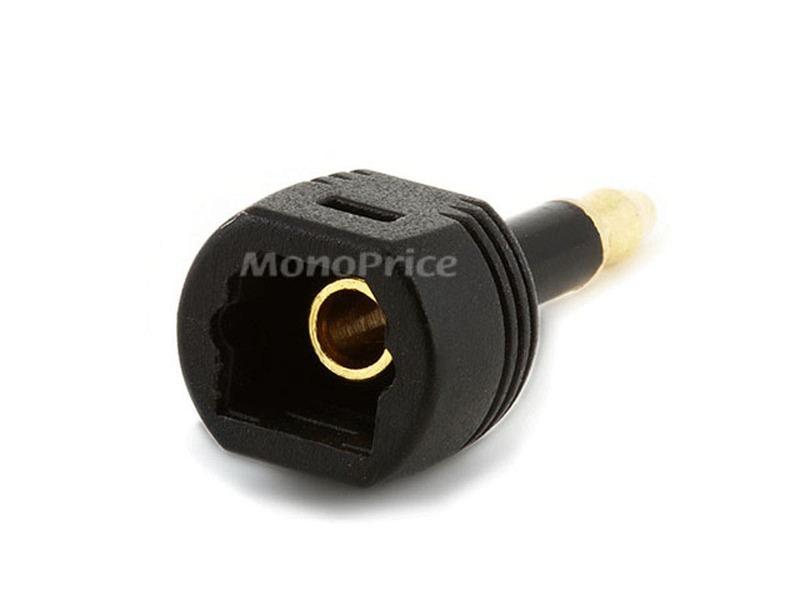 You can't see the plastic stick inside the hole in the website picture here, but without this piece the adaptor will not work. Bought it for an old Sound Blaster X-Fi sound card. I had gotten new speakers that were optical only, but couldn't find my old cord that came with the card. Bought this and plugged in an old TOSLiNK cable, worked great. It's not much more than a passthrough adapter. Monoprice got it to my house (Northern California) in just under 36 hours. Pretty sweet for standard shipping. Unlike all these silly Macbook users, I'm using this adapter with my DOSBox system that has a Creative Labs X-Fi Gamer card. This card has one of those SPDIF jacks that looks like a headphone jack, and while you can easily find a cable that goes to TOSLink, I already have a bunch of TOSLink cables lying around collecting dust, I figured I'd put one of them to good use. Happy to say my DOSBox system now has a beatiful digial audio output which is great because I'm now using the OLD analog audio ports as inputs for my MT-32/CM-32L/GM modules. Hearing old school games through this system is really a treat, and it's this little adapter that really tied my emulation station together.